This!!! We are out on the road! So the final verdict was a new exhaust system, a new turbo, new clamps for here and there, a new made there tail pipe extension and a new gasket for our manifold. Thankfully, the old one had not let the oil leak into the cylinders. As soon as the parts came into the shop they got right to the repair. They asked us to go to a motel so we went to Motel 6 near the Hartford, Ct. airport. They accept dogs but what we found out, only two dogs per room. Oops. So since our rv insurance covers a stay away from home we got two rooms. Hopefully they understand that one! So, Lola and I took one room and Roger and the boys took the other. We had reserved adjoining rooms but we did not get that. Lola Lounging!! Just her and me and I had to fight for space. Over in Roger's room. The two dog rule is silly since we spent all our time in one room then at night Lola and I went to "our room". They have "wood" flooring which is really nice. The dog hair on a rug would have been sad. We spent 2 nights as the service center worked on CiCiBlue, then on the second day, she was fixed. 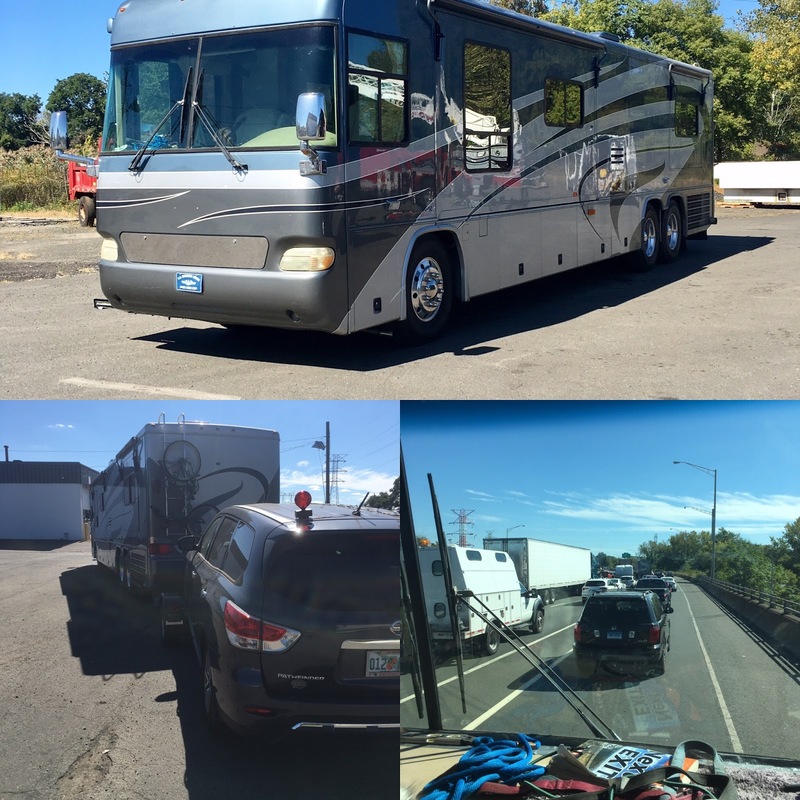 The service manager Mike took us for a test drive on the highway and we heard how quiet the coach had become. What a new exhaust system will do! We still have a low oil pressure issue but as long as CiCi is hot she runs just fine! On our first day at the motel I took Lola out on the back grass area. It was about 8:30 A.M. I had read one review that stated the motel was on the flight path for the airport across the street but at 8:30 A.M. I had forgotten. It came in behind us and was low and right on top of us as it approached the airport. I was scared half to death but the sound but at the same time totally thrilled!! I love watching planes!! For an hour after the hairs on my arm were still at attention! From then on I was either out on the balcony or watching from our window. It was great! While we were in Ct. our friend Lauren stopped by with her three Labs and her husband Jeff. We have known Lauren for 10 years but have never met. I have painted all her Labs quite a few times and she has sent the kids her famous home made doggie treats..and oh..we got her famous cookies!!!! Ozzie needed to Photobomb! Silly boy! The other exciting event was I can now put our car onto the dolly in one try! Before we always joked that I would put out grandstands for people to watch the show. At least 5 to 10 tries before it got on with equal sides. Before we left the service center I asked the manager if he would put it on the dolly and I watched the way he did. Voila'!! Now I'm a pro! So we made it today after 277 miles from Carlisle, Pa to Salem, Va . We are at Dixie Cavern. After a two night stay we will head on to Knoxville, Tn and meet up with friends before we start heading west! It's happening. Tonight I'm thrilled and exhausted so time to feed the kids and put my feet up and rest!! Have a great night and see you tomorrow!! Roger wants to go through the Cavern. 😱 I'll let you know! !